If the given number is equal to the sum of the power of n for each digit present in that integer then, that number can be Armstrong Number in Java. Divide the given number into individual digits (For Example, Divide 153 into 1, 5 and 3) and count them. Compare original value with Sum value. In this article we will show you, How to Write Java Armstrong Number program using While Loop, For Loop, Functions and Recursion. 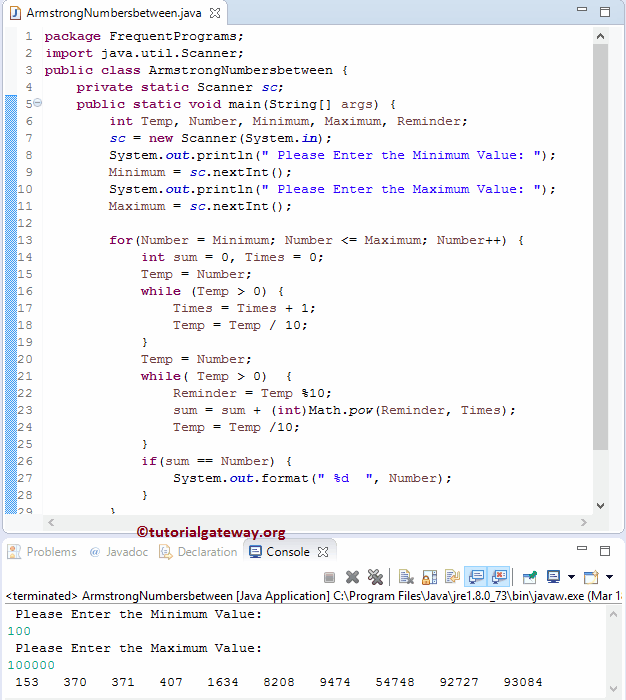 We will also show you, Armstrong Numbers between 1 to n.
In this Java Armstrong Number program, the following statement will ask the user to enter any positive integer and then, that number will be assigned to Number variable. Next, We assign the original value to the Temp variable. This will help us to preserve our original value and then do all the manipulation on Temp variable. Below While loop will make sure that, the given number is greater than 0 and statements inside the while loop will split the numbers and counts number of individual digits inside the given number. If you don’t understand the logic, Please refer Java Program to Count Number Of Digits in a Number article. Second While loop will make sure that, the given number is greater than 0 and calculate the sum of the powers of given number. NOTE: If the number of digits count is 5 then Reminder will be multiplied by 5 times. We just replaced the While loop in the above Java Armstrong Number example with the For loop. This program for Armstrong Number in Java allows you to enter any positive integer and then, this program will check whether a number is Armstrong Number or Not using Functions. 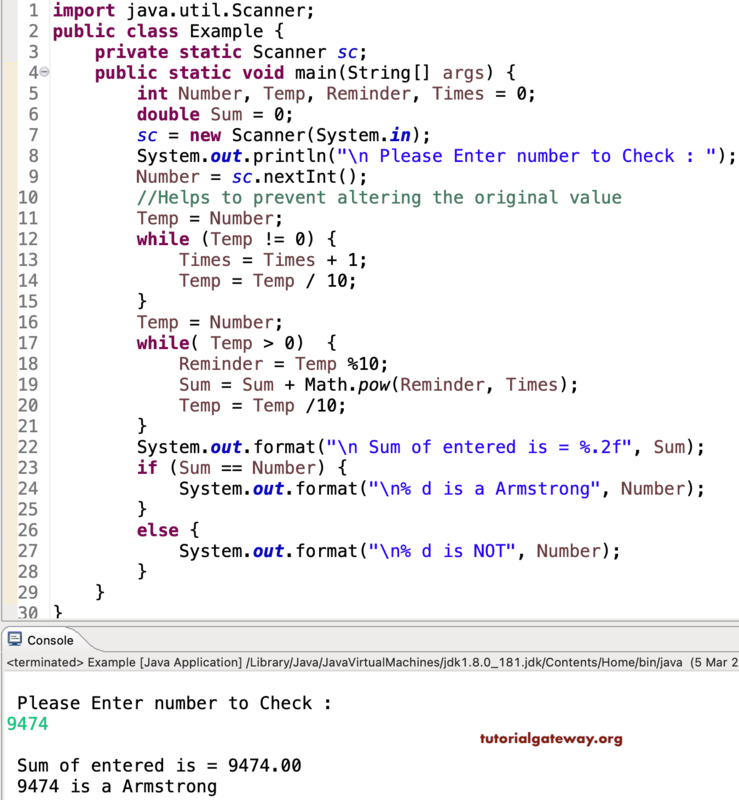 In this program to find Armstrong Number in Java, we are dividing the code using the Object Oriented Programming. To do this, First we will create a class which holds a method to reverse an integer recursively. In this Java Armstrong Number program, First we created one function to count number of digits in a given Number. Next, we declared one more function to calculate the sum of the power of n for each digit present in that integer. We already explained the Logic in above example. NOTE: With the Check_Armstrong(int Number) method we are calling the Count_Number() function to get the Times value. If you want to pass the power value as argument then declare one more argument and remove this line. Next, we are calling the Check_Armstrong(Number) method. This Armstrong Number in Java program allows the user to enter any positive integer and then, this program will check whether a number is Armstrong Number or Not using Recursion concept. In this Java Armstrong Number program, Within the function, Check_Armstrong(int Number, int Times) we are using If statement to check whether the given number is greater than zero or not. This is very important and if you forget this then you will end up in infinite loop. We already explained the logic in our previous examples. Within the If statement we used one 1 extra line. This Java Armstrong Number program allows the user to enter minimum and maximum values. This program will find the Armstrong Numbers between the Minimum and Maximum values. This Java Armstrong Number program allows to enter minimum and maximum values and following For Loop helps compiler to iterate between Minimum and Maximum Variables, iteration starts at the Minimum and then it will not exceed Maximum variable. We already explained the logic in our first example so, please recheck the Find Armstrong Number in Java using while loop example.